This Midcentury Modern classic design was created by the Viking Glass Company. This line was called "Epic" and it is! The Epic Line from Viking Art Glass was produced from 1956 to 1975. 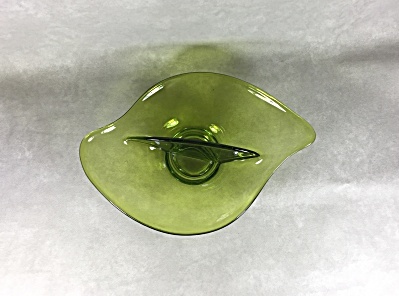 Instead of placing two handles at each side as in a more traditional glass design, the designer included a handle in the middle which also serves as a divider so that the candy dish has more functionality. It measures 8 1/2 inches long x 6 inches wide. The color of the glass? Avocado green, baby! The company called it "olive green". It is ready to sit on your Midcentury Modern credenza and give it a pop of late 1960s color.